The Navajo Native Americans once lived across vast stretches of what is now the American Southwest. 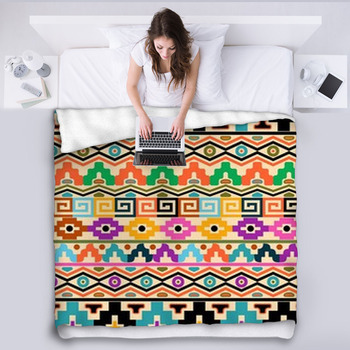 Celebrate the complex culture, dynamic mythology and breathtaking terrains of these unique people with our Navajo blankets. 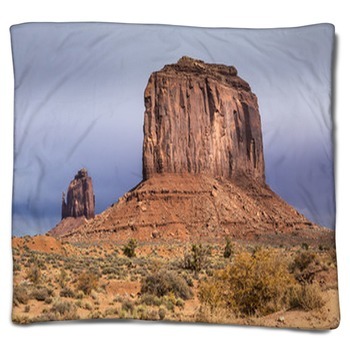 The Navajo theme adds a sense of respect for indigenous culture, the mystery of ancient people, and stunning beauty to the decor of any room where you put one of these customized fleece blankets. 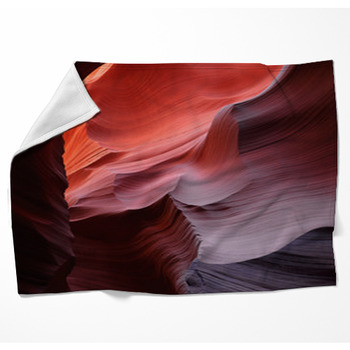 Choose a throw blanket for the living room sofa that pictures the amazing artwork of the Navajo. One of our popular woven blanket patterns features a photo image of the Navajo god Kokopelli etched in brown on a handmade clay urn. This dancing god is seen playing his famous flute amid an abstract design of triangles, zig zags and interlaced lines. 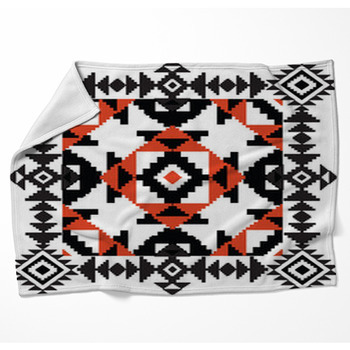 The urn is set on a red, blue, black and white Navajo blanket that forms the background of your own woven blanket. Then give your kids fleece blankets that highlight one of the intriguing aspects of Navajo culture. 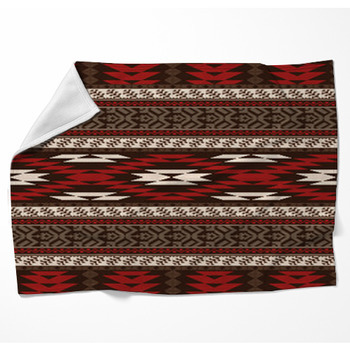 For boys, we have personalized throw blankets that showcase a Navajo warrior. This Navajo brave has a Mohawk and is dressed in a traditional loincloth as he hunts with his bow and arrow in a Southwestern desert. 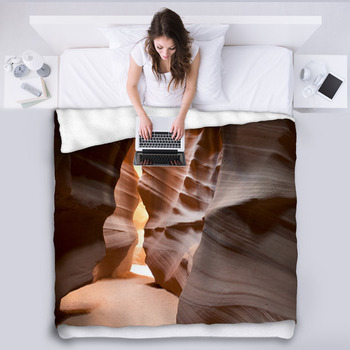 For girls, go for unique Navajo blankets that show a beautiful Navajo woman dressed in a white leather outfit adored with ribbons and necklaces. 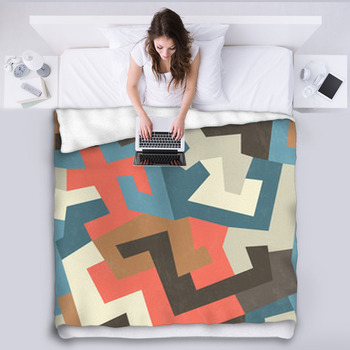 Teenagers are fascinated by the mysterious symbols exhibited on fleece blankets that picture a collage of shapes illustrated in earthy tones of red, tan and brown on a black background. 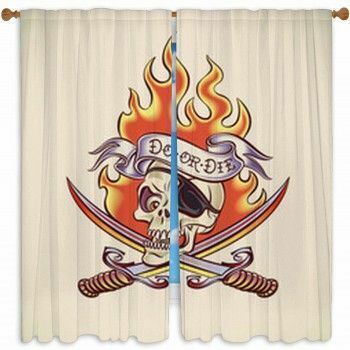 These symbols include hands, deer, snakes, men with antlers and spears, and strange, alien-like figures. 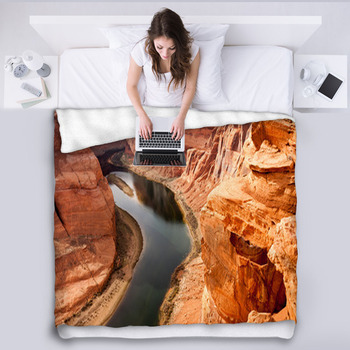 Once your children have our Navajo throw blankets, they'll want to expand the Navajo theme across their bedroom with Navajo wall murals, Navajo rugs and Navajo pillows.